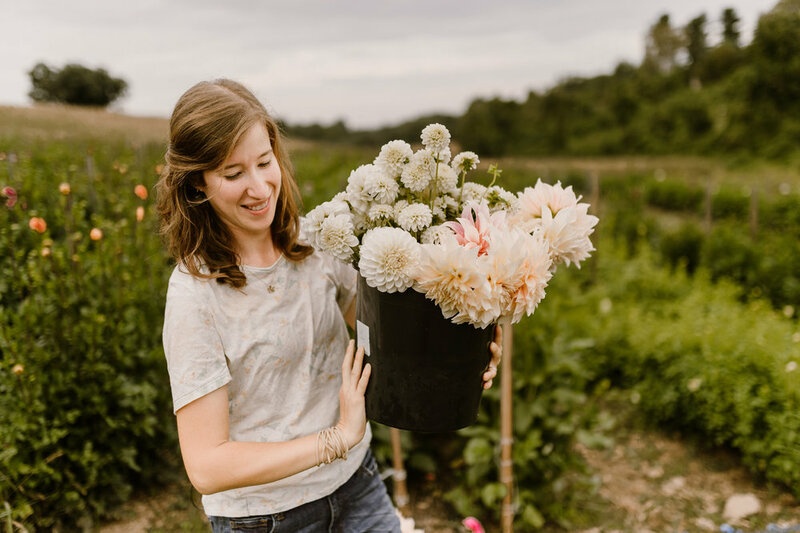 Our mission is to provide locally grown flowers in the Chesapeake Bay area, to serve our customers with quality and care, and to act as stewards of our land. We love what we do! Join our email list for monthly updates! Hi, I'm Laura Beth Resnick, farmer and owner of Butterbee! Farming was supposed to be a little adventure after college, but it turned into my passion and career. Nine years later, I tend to 3 acres of flowers with my artist-turned-farmer husband and a spunky farm team. It's not just about farming. The most joyful and rewarding thing about this job is meeting you- the flower lover, the nature enthusiast, the designer, the betrothed, the curious-minded. These new relationships have bloomed into a community that becomes more dynamic each and every season. We look forward to meeting you, and welcoming you into our flower world!